Cadillac and Lincoln delivered classic luxury in droves with their late-nineties full-size sedans. Today we’re exploring the most opulent trim levels of the Lincoln Town Car and Cadillac DeVille. In their day, these vehicles represented the lap of luxury for shoppers seeking a traditional American luxury sedan. 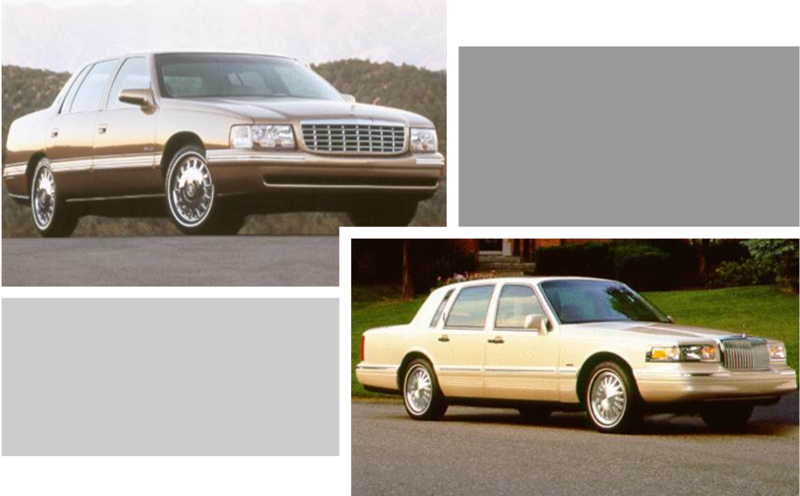 In the 1990’s the Cartier Edition of the Lincoln Town Car was the crème de la crème for Lincoln’s flagship sedan. Positioned above the base Executive Series and mid-level Signature Series trim levels, the Cartier represented the pinnacle of luxury and opulence for the Blue Oval’s upscale brand. Its interior featured upgraded leather and plush carpeting. Based on the tried and true full-size Panther platform, the Town Car was a uniquely American interpretation of a luxury car. With a massive V8 engine, front bench seating and dripping with chrome trim, the Town Car was proudly old-school. Its stoic upright styling set it apart from swoopier designs from Japan and Europe. Perhaps its closet competitor in terms of size and styling was the Cadillac DeVille. In 1997 the Lincoln Town Car Cartier had an MSRP of $43,200, the equivalent of $68,544 in 2018. For 1997 Cadillac introduced the luxurious d’Elegance for its full-size DeVille full-size luxury sedan. The d’Elegance was the mid-level trim for the DeVille, slotting above the base model and below the sporty DeVille Concours. As its name implies, the d’Elegance was focused on luxury and opulence. It featured extra chrome adornments, gold trim, standard leather and heated front seats. Like the Lincoln Town Car, it featured front bench seating. Based off of a front-wheel-drive platform, the mid-to-late 90’s DeVille retained the traditional styling of it’s rear-drive predecessor. Powering this leather-lined conveyance was a 4.6 liter V8. In 1999 DeVille d’Elegance had an MSRP of $42,930, the equivalent of $65,959 in 2018.